It may seem like All Hallow’s Eve is all about candy and costumes. Don’t worry! Spooky demons and even scarier, little girls dressy too provocatively, can be augmented by tasty treats. Veggies can be the scariest guest at the party—and it’s not just because they are veggies. It’s all about presentation, and making things look spooky doesn’t need to take away from your costume prep time. Cheesy fingers can be created using string cheese, a green bell pepper and some cream cheese. Start by wearing plastic gloves. Sandwich bags will work. Covering your hands will keep the cheese smudge-free. Use a paring knife to cut the string cheese in half and carve a shallow area at the end for a fingernail. Mark the joint to the finger by carving out tiny horizontal wedges of cheese. Lastly, cut a bell pepper into 3/8-inch-wide strips. Trim the pulp to cut the thickness in half. Then, cut the stripes into nail shapes which will stay on the ends of the “fingers” using a dab of cream cheese. Voila! You’ve created dead zombie fingers. Maybe a skeleton is more your speed. 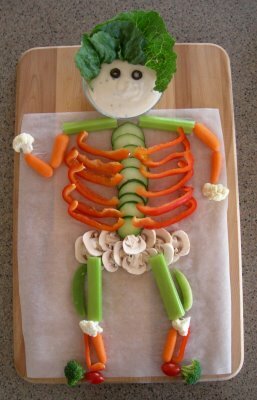 Chopping veggies can provide the “bones” for your masterpiece. After cutting a variety of veggies – like bell peppers, mushrooms, carrots, cherry tomatoes for joints, and even cauliflower – ask your little one to lend a hand creating the skeleton! Strips of carrots could be rips. Better yet, curved bell pepper strips kind of resemble rib bones… Work together and don’t forget to incorporate a bowl of dipping sauce! Mummy pizzas can make nice treats. Using English muffins, pizza sauce, cheese and some pitted olives, the wrapped undead can be served to your little ones. In fact, maybe the veggies you chopped for the other Halloween classics like Frankenstein. It all starts with the sauce. Pizza sauce can be easily purchased or just as easily made at home. In a medium bowl, mix together a 15-ounce can of tomato sauce and a 6-ounce can of tomato paste until smooth. Then stir in 1 tablespoon of oregano, 1 ½ teaspoons of dried, minced garlic and I teaspoon of ground paprika. Toast the English muffins then spread some sauce over. Use shredded cheese to make a mummy face. Leave an opening for olive eyes! Green peppers, carrots and olives could create the monster Frankenstein. Can you make a Dracula too? These quick treats can be prepared early. Pop them in the oven shortly before you’re ready to serve. Using broil will allow the cheese to melt and toppings to be warmed. Be sure to keep an eye on these! It should only take a couple of minutes. These are just a few ideas. Do you have any to share?